How Do You Convey Seeds Without Breakage? supplement or snack food. From experience they knew that many types of conveyors would abrade or break some of the fragile seed hearts. Consumers expect to receive unbroken hearts with the natural green skin intact. Any visible flaw significantly reduces their value. Sunshine Produce challenged Cablevey to use their test protocol to prove that a Cablevey would be superior to what cheaper competitors offer. Cablevey has several of their own conveyors installed in their facility to demonstrate how well customers’ materials will convey. Sunshine shipped test sample seeds to Cablevey. Three Cablevey employees worked for 2 days examining each individual seed until 80 lbs. of perfect seeds had been sorted. When Mr. Liyuan Chen, Managing Director of Sunshine, arrived in Oskaloosa he was able clarify test details before witnessing the tests. Seeds were weighed, the quantity of water to add was calculated, and they were mixed by hand in plastic tubs. After soaking the seeds for 6 hours they were loaded into the conveyor. Mr. Chen observed that the seeds conveyed very well and afterward he took a small sample of the seeds to examine. He inspected them very closely and concluded that very, very few were damaged. Pumpkin seeds are an ingredient in many Mexican dishes and their oil is prized for cooking in middle Europe. In the US, roasted seeds are often used as a healthful, high protein, snack food. 100 grams (3.5 oz.) 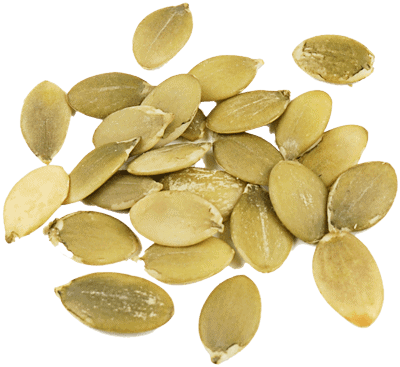 of pumpkin seeds provides 54% of the daily requirement for protein and 16% of the fiber. It is one of the best sources of plant-based Omega-3 fats that help lower bad cholesterol (LDL). This promotes clear arteries to prevent heart attacks and strokes. They also contain phytoestrogens that increase good cholesterol (HDL) and reduce postmenopausal symptoms. It provides 80% of a day’s needed zinc which promotes both the immune system and prostate health. It also gives 214% of the manganese, 155% of the magnesium, 168% of the phosphorus, and 62% of the iron needed each day. The seeds are rich in B-complex including 6% – 30% each of B1, B2, B3, B5, B6, and B9 vitamins. They also contain 8% vitamin C, 4% E and 4% K.
Research studies suggest that the seeds may block the hormone DHEA to reduce the risk of prostate and ovarian cancers. Animal studies suggest that they improve insulin regulation and reduce oxidative stress to decrease diabetic complications including kidney failure. 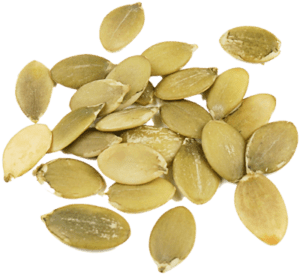 One animal study found that the anti-inflammatory effects of pumpkin seed oil worked as well as the drug indomethacin in treating arthritis.